The Eftalia Aqua Resort is set in a lovely location of Tukler district, well-known for its pebble beaches and sands. The sparkling town of Alanya in Turkey is also near to the resort, where you can go for shopping and visit the various bars and restaurants. This family-friendly resort has an outdoor pool, including water slides. If you want to relax and rejuvenate yourself, utilize the spa facilities at the resort. Other than this, there is a private beach area, where the hotel guests can relax and have fun in the sun. The hotel also offers all kinds of nightly entertainment to the guests. All the rooms in the resort have contemporary furnishing and breakfast in buffet style is available on a daily basis. Taste Ottoman, Turkish and Italian cuisines at the resort’s restaurant to satisfy your appetite. There are many flights to Antalya in Turkey from all the major cities across Europe. Situated about 18 km away from the Mediterranean pearl, the Eftalia Aqua Resort is nestled amidst the Tukler district, renowned for its pebble beaches. 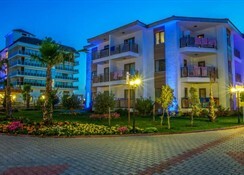 The resort is also close to shops, bars and restaurants, as the town centre of Alanya turkey is within 20 km. 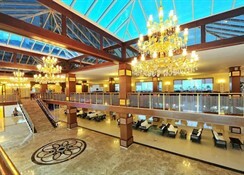 The Antalya Airport is about 107 km away from the resort and the Gazipasa Airport is only 60 km away. The Eftalia Aqua Resort has 470 beautifully decorated rooms with magnificent views. The rooms are categorized as Relax Room, Standard Room and Family Room. The Relax room comes with one double bed and one single bed with all the necessary amenities. The Standard rooms are designed to host the guests in the best possible manner. These rooms have 1 comfortable double bed and 1 single bed. It can accommodate up to 3 people with all the necessary amenities. The Family rooms offer extra space for guests, they are designed as 2 rooms with 2 single beds and 1 double bed with a sofa. All the rooms come with all the necessary amenities that include television, air conditioning, mini bar, telephone, safe deposit box, balcony and much more. The resort serves all-inclusive breakfast, lunch and dinner. There are a variety of delicacies offered in the a la carte restaurant, including the Ottoman Cuisine, Asia Cuisine, Grill Cuisine and much more. Besides this, you can also enjoy local dishes and fresh seafood in the restaurants. The resort also serves local alcoholic and non-alcoholic beverages throughout the day. The mini bar in the room is refreshed on a daily basis with soft drinks, water and soda. The sports and entertainment facilities at the resort will make your holiday even more enjoyable. You can get yourself engaged in a number of sports activities like jet skiing, banana, surfing, sea bike, parasailing, catamaran and canoe rentals. There is an on-site water park, where both adults and children can enjoy water activities, including the main pool, small water lounges for adults and children, children’s pool, boomerang water slide, pirate boat, octopus, tropical tower, free fall water slide and rafting. Guests who want to relax and rejuvenate themselves can head to the spa and wellness area, which has facilities like Turkish baths, steam room, sauna and massage services. The resort also organizes entertainment for everyone. Live music, entertainment programs and night shows are organized for children too. There is a world of games and fun for the little guests in the Children’s World. Pirate boat, tropical tower and pirate boat are designed for children below 6 years. Children between 7-10 years of age can get themselves engaged in a variety of water sports and activities too. VISA and MasterCard accepted here.